It’s all change again at the head of the Bedfordshire League with Renhold United now two points clear following their 2-0 home win over Sandy thanks to a brace of goals from Alex Woolston on Saturday. Now down into second of the Premier Division supported by Sportsform are Shefford Town & Campton on a four game losing run after being beaten 3-1 at home by AFC Kempston Town & Bedford College. Josh Sturniolo, Courtney Broughton and Andrew Latimer were on the winners scoresheet against a lone home reply from Adam Larsen. 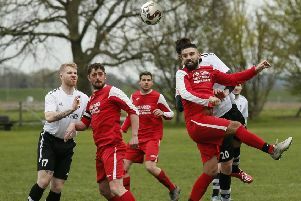 Perhaps Renhold’s most serious challengers for the league title are now Flitwick Town who took their unbeaten ways up to 10 games with an 8-1 win over second from bottom Wilstead in a game switched and played on their own Flitwick Community Centre pitch. Jim Lewis, Will Scutt and Alex Robinson Welsh all netted twice alongside single strikes from Josh Reynolds and Daniel Stafford against a lone reply from Kevin Butler. The other three scheduled fixtures were called off. AFC Oakley M&DH will now contest the final of this season’s Senior Trophy against Crawley Green or Bedford FC who had their scheduled game frozen off after they netted a 6-5 home penalty shoot out win over South Midlands League Langford. 1-1 ,at 90 minutes with Mark Smith from the penalty spot on the Oakley scoresheet their shoot-out hero turned out to be goalkeeper Robert Nash in saving five Langford efforts. Elstow Abbey now find themselves eight points clear at the head of division one supported by Wests Citroen Bedford following their 3-0 victory at second place Henlow to take their unbeaten ways up to 10 games. Early drama was to see home goalkeeper Nick Stilwell get down well to save a sixth minute penalty from Callum Davenport and then produce a series of fine saves which, coupled with some woeful finishing by the Abbey, saw 0-0 reading on the scoreboard at half-time. Yet within six minutes of the restart Abbey were two goals clear thanks to strikes from Aaron Cavill and Dom Parrella and when home player Keith Purslow was red carded 10 minutes from time they were almost home and dry. They most certainly were after Shaun Cafferty added a third goal three minutes from time. Still very much in the title race race are third place Cranfield United who, having played four games fewer than the Abbey and Henlow, sit just nine points adrift of the leaders after they retained their unbeaten home `record and took their current winning run up to eight games with a 2-0 win over Riseley Sports. This was thanks to goals from Liam Whitmee Craig and Martin Holland. Whilst fourth place Great Barford slipped up when held to a 2-2 home draw by Meltis Albion. Elijah Hukin and Reuben Hukin were on the home scoresheet to take their unbeaten ways up to 11 games against Albion replies via Carl Townsend and Sahr Songa. Having lost their last five away outings Sundon Park Rangers returned to winning ways on the road with a 4-0 victory at AFC Oakley Sports M&DH Reserves. Matthew Conway netted twice alongside goals from Kane Griffiths and Shaka Anderson. Whilst also enjoying life on the road were Queens Park Crescents who netted their first away win of the season 2-0 at Potton Town thanks to goals from Ben Griffith and Fabio Sattar. Elsewhere it was the sharing of the points for Shefford Town & Campton Reserves and AFC Kempston Town & Bedford College Reserves in a 1-1 draw at Rectory Road. Malcolm Marimirofa netting the home goal and Keegan Roberts replying for Kempston. For Clapham Sports their days to head the division two table looked numbered after second place Stevington, who have played five games fewer took their winning ways up to 12 games with a 6-2 win over them. Reece Williams and James Bourke both netted twice alongside Joe Holyoke and Ben Walsh against Sports replies from Sam Maddix and Paolo Grasso. Also having played five games fewer and now up into second spot, just two points shy of Clapham Sports, are FC Houghton who took their own winning ways up to 12 games with a 7-1 victory at third from bottom Caldecote Reserves. It was the home side who netted first via Matt Basta after just 30 seconds and half-time arrived with the scoreline at 1-1 before the visitors run riot in the second period. Sam Martin with a hat-trick alongside braces from Mark Doran and Lawrence Taylor their marksmen. Losing out on that third spot were Westoning who saw their home game with Renhold United Reserves postponed. However, they remain very much in the title race being just three points behind Stevington and two adrift of FC Houghton but with a game in hand on them both. It was a red letter day for bottom side Wilstead Reserves who claimed their first victory in winning 7-2 at Meltis Albion Reserves who have now lost their last eight outings. Callum Evans netting a hat-trick, Luke Prietzel a batch to go with single strikes from Luke Pursey and Sam Ward against home replies via Dave Bevan and Josh St Clair Pierre. For Bedford United its now six league games without a home league win after they were held to a 4-4 home draw by Marston Shelton Rovers Reserves. Aaron Perrett, Adam Wodecki, Julio Fortes and Tom Wade on United’s scoresheet whilst Jamie Cerminara netted all four of the Rovers replies. Having lost their last three away games Kempston Athletic returned to winning ways on the road with a 2-0 victory at Wootton Village thanks to goals from Mark Nicholson and Dee Sayid. The scheduled Kempston Hammers v Moggerhanger United game was called off. There is no change at the head of the division three table following wins for the top two sides. For league leaders Flitwick Town Reserves it was the retention of their season’s unbeaten home ways to stretch their unbeaten record up to 10 games with a 2-0 victory over White Eagles. Dean Conway and Oliver Banfield netted the goals to do the damage. Whilst second place Lea Sports PSG claimed an all important 1-0 home victory over third place Cranfield United Reserves thanks to a strike from Kane Smith put paid to the visitors six game winning run. Following a run of five games without a win Atletico Europa returned to winning ways to climb back into fourth place with a 4-0 victory at Sandy Reserves. Kane Alexander scored twice alongside single strikes from Mo Banda and Daniel Avis to do the damage. Losing out on that fourth spot are Clifton who have now lost their last five away outings after being beaten 4-2 at FC Serbia. Milan Marusic with a brace plus Marko Djordjic and Zdenko Kuhar on the home scoresheet against replies via James Bennett and Jack Brown. Caldecote U20 find themselves without a win from their last 11 outings after being beaten 2-1 at home by Shefford Town & Campton A who ended a run of four consecutive away defeats. Sam Larsen and Marcus Rose netted the vital goals against a lone home reply from Rafe Goodman. The scheduled Mid Beds Tigers v Dinamo Flitwick game being frozen off.